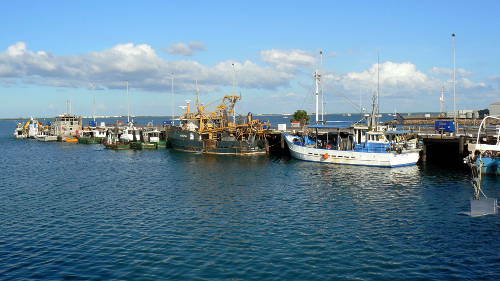 Darwin Fisherman's Wharf is the hub of the fishing and pearl industry in the Northern Territory. 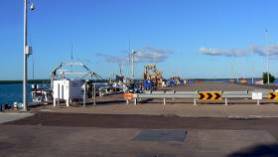 Perkins barges leave from here to provide cargo transport to Groote Eylandt and Nhulunbuy while the Marina provides safe haven for commercial fishing and trawling boats. This concrete wharf can berth up to eighteen 30m boats where they can use power and phone access. Bunkering is available. making this a useful facility for local boats. Local businesses in the area next to the wharf suppy the marine trade with supplies and services. There are slip rails and maintenance facilities on the site including a machine shop, fabrication shop and electrical workshop. Repair berths for vessels up to 80m long are available. Fishing vessels, offshore supply vessels, tugs, barges and naval patrol vessels take advantage of these facilities which removes the necessity for voyages to Freemantle in Western Australia or Cairns in Queensland. Next to the wharf is the Marina operated by the Darwin Port Corporation to provide up to 85 berths for the Northern Fishing fleet. A lock provides access to the marina and safe, tide free, sheltered moorings for the boats. Lock attendants are available 7.30am - 3.45pm weekdays, call-outs apply at other times. 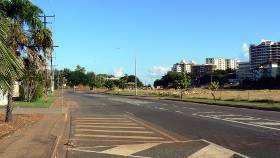 The Darwin Fisherman's Wharf and Marina are located on Frances Bay Road, a short distance from the city and Stokes Hill. The open area across the road is the site of the original Railway Station. The new Railway stops at East Arm wharf near Berrimah. Return from Darwin Fishermans Wharf to Enjoy Darwin Home.